I watched a few mixed media videos recently and wanted to give it a try. I started out by cutting a piece of mixed media card stock to the size of 4x 5.25 inches. Applied mod podge to it using a foam brush, then I added my torn designer paper scraps to the card, and then brushed mod podge over it again. Rubbed some gesso here and there onto the designer paper and more mod podge. Inked up the grass and some other background stamps using distress ink. A heating tool was used to dry it, but the grass did end up smearing a little bit. 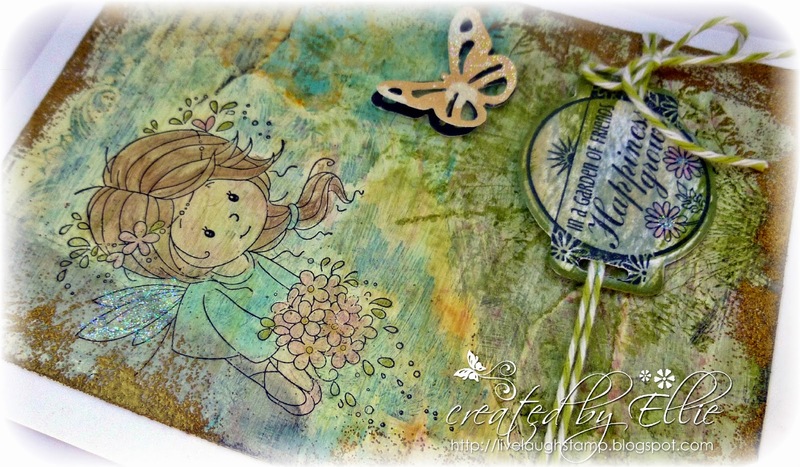 The fairy (Whimsy Stamps - Flower Fairies) was stamped using stazon ink, and I used distress inks for coloring her in. I inked up the edges using versamark and sprinkled some gold embossing powder onto it for a golden edge. Sentiment (Whimsy - Lovely Spring Sliders)was stamped onto white card stock, distressed with inks, and then cut out using a whimsy stamps Slider 2 die. Finished it off with some twine and added a punched butterfly. I know this is a little different from my usual style, but I really want to try a few different techniques. Gorgeous design love your background! Thanks for joining Creative Knockouts! Wow, thanks for sharing your Mixed Media card at our 'Anything Goes challenge'!